Newkirk City Hall is located at 107 West 7th Street, Newkirk, OK 74647; phone: 580-362-2117. Photo: Sheets House, ca. 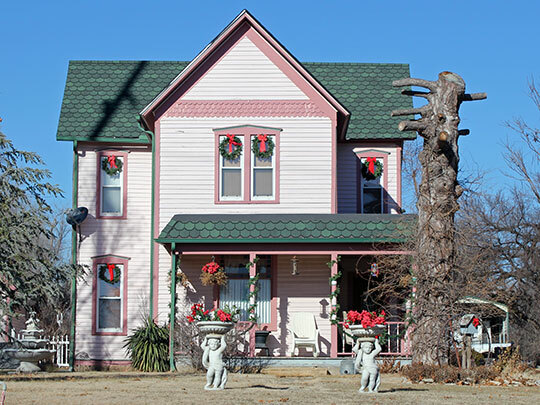 1887, 1350 West Peckingham Road, Newkirk, OK. Listed on the National Register of Historic Places in 1976. Photographed by user:Jeffrey Beall (own work), 2013, [cc-by-3.0 (creativecommons.org/licenses/by/3.0)], via Wikimedia Commons, accessed June, 2014. Originally part of the Cherokee Strip opened for settlement in the Land Run of September 16, 1893, the town was called the "Gate City of Oklahoma." Settlers flooded across the Kansas border to file claims for lots in the central business district, attractive to merchants because of Newkirk's designation as the county seat of new "K" county and because of its proximity to the existing Santa Fe railroad and because the district was a potential mercantile center for area homesteaders. A prosperous "tent city" typical in Land Run towns, sprang up in the central business district overnight to provide goods and services to settlers passing through town on the way to claim lots in "The Banner Wheat Country." Frame structures soon sprang up to house some twenty-five saloons, several blacksmith shops, restaurants, livery stables, real estate and law firms, and a rowdy dance hall. At least four hotels were part of early Newkirk, as were several banking institutions. Early in the 1890's, a local quarry began supplying the stone that was used on a few of the earliest permanent central business district buildings. After a fire in 1901 completely destroyed the two story frame establishments on the East side of Main between Sixth and Seventh, most buildings constructed after that year were of the local stone, or occasionally or brick. Two factors contributed to the early and continued prosperity of Newkirk. Even before the area was opened to white settlement, the U.S. Secretary of the Interior designated the townsite as a county seat. The role as county seat guaranteed a constant stream of business for merchants as area residents conducted business district lots adjacent to the property platted as the public square. The location of the county seat was contested by two other county towns, Blackwell and Ponca City, after the original frame courthouse burned in 1897. Balloting for the honor took place in 1908, and following four more years of contention, Newkirk again was declared the legal county seat, Insuring prosperity for the town stemming from the constant flow residents from all over the county. Lauri Croft with Dr. Mary Anders, Newkirk Central Business District, Kay County, Oklahoma, nomination document, 1984, National Park Service, National Register of Historic Places, Washington, D.C.